Skirted PCR plates are the most stable type of microplate. A full skirt reduces plate distortion and ensures that the plate sits flat. These plates are ideal for automated handling and other robotic procedures. 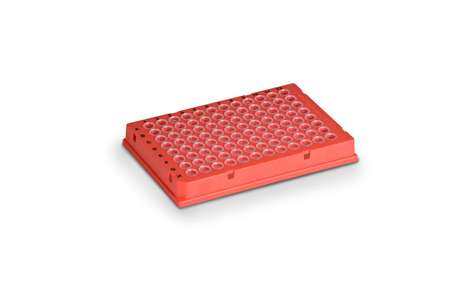 Skirted PCR plates are compatible with a smaller number of instruments than semi-skirted plates. Our skirted PCR plates are compatible with Bio-Rad’s C1000 Touch™ and S1000™ Thermal Cyclers and all CFX series real-time PCR systems. Use the PCR Plastics Consumables Selector Tool to determine individual plate compatibility with other instruments.